Most of us already know that dark chocolate is good for us thanks to the studies that have been on the news and in our local papers. Now don’t just run out and grab a Hershey bar or a pack of M & M’s from your local grocery store, candy chocolate is not what they are talking about. Cold pressed chocolate that has not been heated or dutched like traditional chocolate is the best for you as it keeps in the antioxidants that are so important for your health. That is why I am so thrilled to share with you the Give Thanks promotion that offers a Buy 2, Get 1 Free deal on XO Healthy Chocolate products. Not only is this a great deal for you and your family, this will also make a great gift idea for those you love and care about. What better gift than a gift that tastes amazing and is so good for your health? Order now at LiveForChocolate.com through 12/1/13 to get this great Buy 2, Get 1 deal. No coupon or promo code is needed. You will be prompted to add your free product to your order! If you have any questions or issues, please give me a call and I would be happy to help you place your order. I can be reached directly at 941-216-5727.
chocolate. Just 3 pieces a day is more antioxidants than most of us get in a week. Unfortunately the majority of us do not have the time to eat 8-10 servings of fruits and vegetables a day. That is why healthy chocolate is so wonderful. You can simply eat three pieces of chocolate a day, enjoy the Xe energy drink like Bill O’Reilly of the O’Reilly Factor does or enjoy a Chocolate diet protein shake like I do. 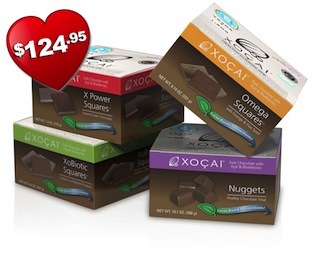 There are so many ways to increase your antioxidants with XO chocolate. I get my antioxidants in chocolate. How do you get yours?